Jane McAuliffe est doyenne et professeur à l’École des Arts et des Sciences de l’Université de Georgetown à Washington. Elle est actuellement présidente de la Bryn Mawr College. Islamologue reconnue et impliquée activement dans le dialogue interreligieux, elle est l’éditrice du monumental encyclopedia of the Qur’an. The Muslim perception of Christianity and Christians is an issue of longstanding debate among scholars of both Islam and Christianity. In this book, Jane McAuliffe analyses a series of passages from the Qur’an that make ostensibly positive remarks about Christians. 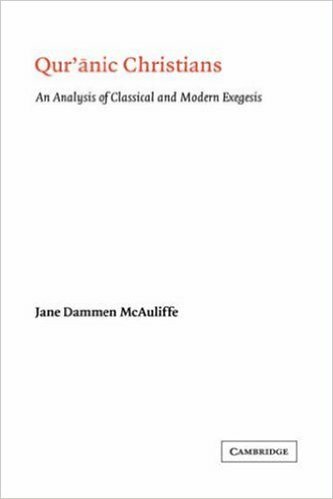 She conducts this analysis through a close examination of Muslim exegesis of the Qur’an, spanning ten centuries of commentary. In this effort to trace various interpretations of these passages, the author attempts to determine whether these positive passages can justifiably serve as proof-texts of Muslim tolerance of Christianity. She finds that commentators have consistently distinguished between the vast majority of Christians, who are denounced for having turned from the true word of God, and a small minority, who accepted the prophethood of Muhammed and are praised. Acknowledgements ; Abbreviations ; Introduction ; Part I. Qur’anic Commentary and Commentators : 1. Text and tafsir ; 2. From Tabari to Tabataba’i ; Part II. Qur’anic Commendation of Christians : 3. Nazarenes of faith and action ; 4. Followers of the Qur’anic Jesus ; 5. Steadfast and submissive ; 6. The promised bounty of piety ; 7. The praiseworthy amity of Christians ; 8. Christians as pre-Qur’anic Muslims ; 9. Compassion, mercy and monasticism ; Conclusion ; Works cited ; Index of Qur’anic verses ; Index of names and subjects. Ouvrage consultable (en partie) sur internet.